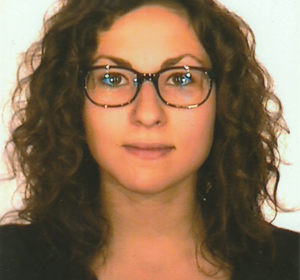 Many congratulations to Mariana M for her recent MSc graduation with excellent marks. 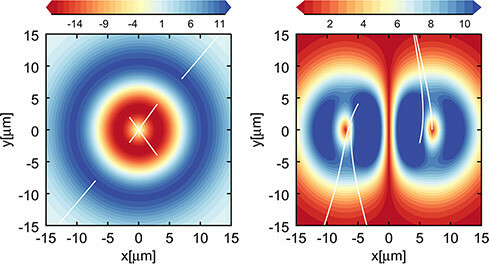 Mariana will now become a CERN fellow while pursuing her PhD degree with our team working on the AWAKE experiment under the supervision of Jorge V.
A recent paper in Physics of Plasmas by Hossein S, Jorge V, and Luis OS “Ponderomotive beatwave ion acceleration using twisted light” has been highlighted in AIP Scilight with the article “Hollow counter-propagating lasers extend the energy of optically accelerated ions” by J. H. Majors. The highlight is available here. Our team attended the 59th Annual Meeting of the APS Division of Plasma Physics, October 23 – 27, 2017 in Milwaukee, Wisconsin presenting several posters, delivering one invited talk in the general session, two invited talks in a mini-conference, and several contributed talks. The IOP reception was another great opportunity to have a good time with many of our friends. 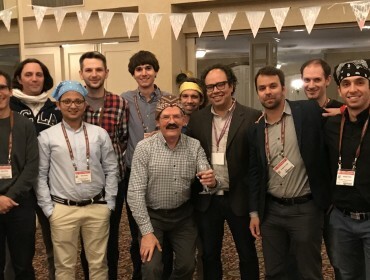 From left to right, Ricardo F (IST/ISCTE-IUL), Warren M (UCLA), Jorge V (IST), Thomas G (IST), Nitin S (IST), Anton H (IST/UCLA), Sam T (SLAC/Stanford), Bob B (RAL/Strathclyde), Kevin S (IST), Luis OS (IST), Frederico F (SLAC/Stanford), Xavier D (CEA), Paulo A (SLAC/Stanford), and Nuno L (LLNL). Luis OS delivered a talk at the Swiss Plasma Centre and another talk in the 1st EPFL Physics Day on October 16 in the incredible Rolex Learning Centre at EPFL. 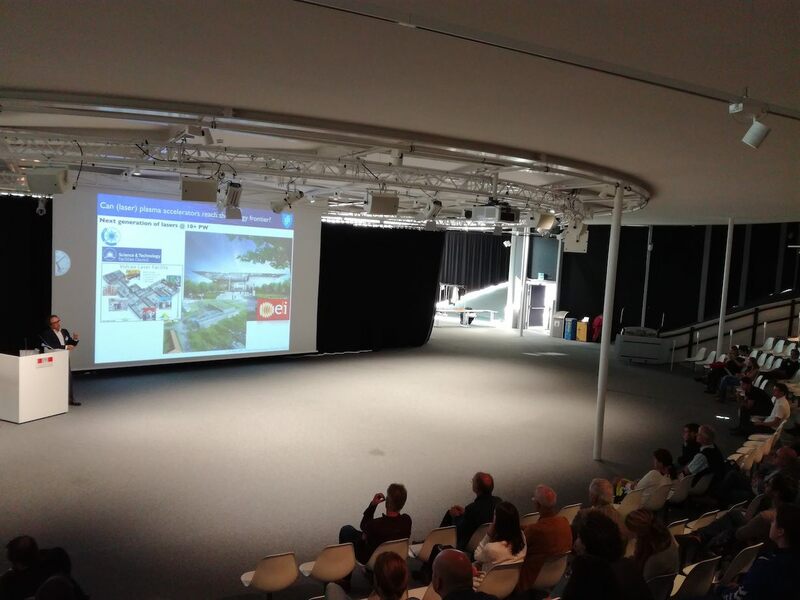 The talks presented some the recent developments of our team in plasmas under extreme intensities. Our team had a strong participation at the 1st Osiris Users and Developers Workshop organized at UCLA from Sep 18 and Sep 20 (a joint organisation between UCLA and IST). 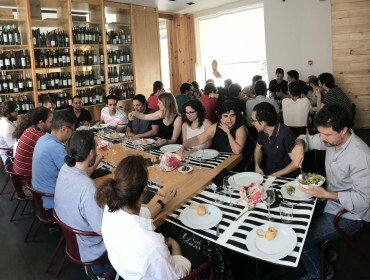 With over 50 participants it also an excellent opportunity to learn about all the exciting developments in Osiris, also some of the cool physics being explored, and, of course, meet again our alumni and friends (in the photo, from left to right, Fabrizio DG, Anton H, Kevin S, Fabio C, Diana A, Ricardo F, Paulo A, Thomas G, Giannandrea I). The website of the workshop, including presentations, is here. The next workshop will be held at IST in 2018. 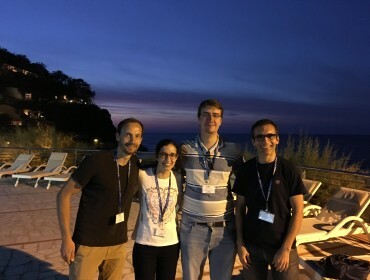 Our team members Jorge V and Thales S attended the 3rd European Advanced Accelerator Concepts Workshop 2017 in Elba, Italy, La Biodola, Isola d’Elba, Italy, delivering talks and presenting posters. This was also an opportunity to follow up on collaborations, committee meetings, and meet old friends and GoLP alumni. In the picture, Timon M (now at DESY), Joana LM (now at Chalmers), Thales S and Jorge V.
From September 5 to September 8, some of the top experts on Extremely High-Intensity Laser Physics convened at IST for the ExHILP 2017 with more than 110 participants, 58 talks and 42 posters in a conference with lots of exciting progresses, engaging speakers, including a flash presentation of the posters and a lively poster session. The next ExHILP is already scheduled for 2019 in South Korea, and there is already a proposal to host ExHILP 2021, thus guaranteeing an exciting venue for all the developments in these topics. 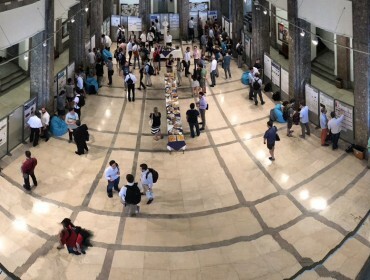 Thank you very much to all the participants: we look forward to welcome you in Lisbon soon! 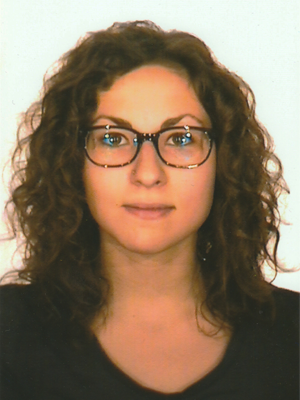 Marija V has been awarded the 2017 John Dawson PhD Thesis Prize for her thesis “Extreme laser-matter interactions: multi-scale PIC modelling from the classical to the QED perspective” at IST. 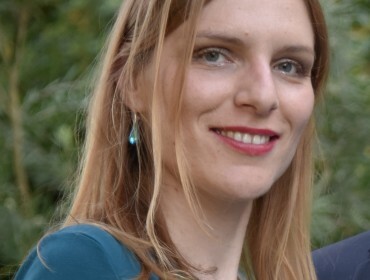 The “John Dawson Thesis prize” is awarded on a biannual basis for the best PhD thesis in the area of compact plasma based accelerators driven by ultra-intense laser pulses. The prize was awarded at the Laser and Plasma Accelerators Workshop held at Jeju Island in South Korea, from the 27th of August to the 1st of September 2017. The prize is named after John Dawson, the founder of the field of plasma based particle acceleration. He worked and lived in Los Angeles. 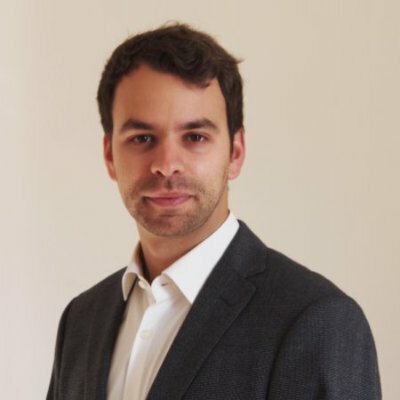 Frederico Fiuza, GoLP and epp team alumnus, and now staff scientist and leader of the theory group at the SLAC’s High Energy Density Science division has been awarded a prestigious DOE Early Career Research Grant to develop work at SLAC. 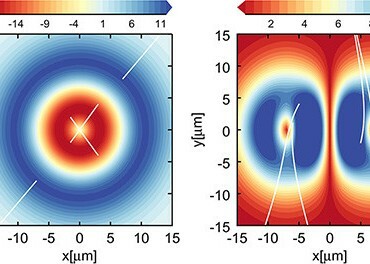 The work will focus on particle acceleration in plasmas. More information here. 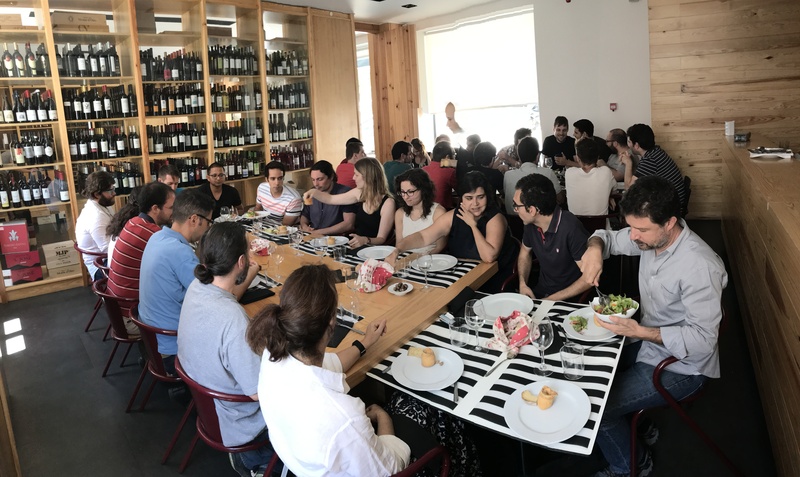 Another GoLP summer lunch meeting was held July 26, 2017 were all GoLP members had the chance to interact in the informal atmosphere of Mesa do Bairro over a selection of typical portuguese petiscos and great science discussions.